With the hushed solemnity of Pilgrims before a holy relic, four American tourists gaze at an unoccupied bar table in an English pub. “Will you just look at that” one exclaims. The two men in the group begin to take photographs, not of their wives with the table, but of the table itself. For the millions around the world who are devotees of James Herriot, the British veterinarian and author, this incident, recalled by Liz Hopwood, the pub landlady, will make sense. For those who have not been touched by Herriot’s folksy writings about life as a vet in rural northern England, it may take some explanation. The table, you see, in the saloon of the Kings Arms in the village of Askrigg, North Yorkshire, was once briefly glimpsed in the BBC-TV adaption of Herriot’s All Creatures Great and Small. James Herriot has never supped a pint of bitter while sitting at it, nor has he ever frequented the Kings Arms. 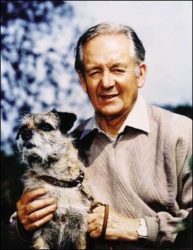 Indeed, strictly speaking, James Herriot does not even exist–it is a pen name for one James Alfred Wight, a real, though now retired, vet who lives and writes outside a town called Thirsk in a quite different part of Yorkshire, about 50km to the east of Askrigg. Yet such is the adulation for what Wight calls his “little cat-and-dog stories” that even a piece of furniture distantly, and with some effort of imagination, connected with him can elicit acts of homage from admirers. In literary terms, Herriot’s writing may be as homely and bucolic as an English village tea shop, but make no mistake, he is a major author. His latest book, Every Living Thing, which takes the story of Herriot/Wight’s family and practice into the ’50s, came out in Britain in October and went straight into the Top 10 of the British best-seller list. In the U.S. it has been high on the New York Times best-seller list for three months, and the publisher has rushed 865,000 hard-cover volumes into the marketplace with all the anticipatory fervor of a cow in clover. The figure is more remarkable given that Herriot is 76, has long since retired as a vet and has not published in a decade. But the pent-up demand by readers for an unchallenging, uplifting breath of fresh–if occasionally farmyard-scented–air from Yorkshire seems greater than ever. If all 865,000 copies of the new book are sold in the run-up to Christmas, Herriot will be on the way to dwarfing even his previous massive sales. Twenty years ago, his first U.S. book, All Creatures Great and Small, sold 206,000 in hard-cover and 4.1 million in paperback. Later books all managed around half a million in hard-cover and several million in mass-market editions. All Creatures still holds the record as the most popular Reader’s Digest condensed book in that series’ 42-year history. If unpretentiousness could be measured like book sales, Alf Wight, possibly the least likely popular idol of the late 20th century, would also break records. Meet him for lunch in his hometown, and you are made to feel you have done him a kindness by traveling to Yorkshire, when it is he who has granted a rare interview. Publicity he can take or leave, and for 10 years has chosen to leave it: “I’m one of those lucky people who don’t need anything,” he says in the soft accent of his native Scotland. Wight, whose mother was a singer and whose father played the piano in a movie theater, came to Yorkshire fresh from Glasgow’s veterinary college in the ’30s in response to a small ad for an assistant vet. He never left the county–or the country–despite urgings in recent years by tax accountants to depart for an offshore tax haven. Once he and his wife Joan were taken bodily to the island of Jersey by a financial adviser determined to prove his point, but even with marginal income tax rates in mainland Britain at the time running as high as 83%, Wight calculated that he could live comfortably in Yorkshire on the small percentage of his books-boosted earnings the taxman allowed him to keep. He stayed in practice in the North Country, combining a winning barnside manner–only two dog bites in a 50-year career–with writing in front of the television set in the evenings. Wight is a dapper man, courteous, a little frail but by no means in his anecdotage. He has a still unexhausted mental filing system of sentimental animal stories and homespun philosophy. The fact that James Herriot of the imaginary Darrowby is really Alf Wight of Thirsk is no longer a secret. A quaint journalistic convention of not identifying him or his location grew up early in his writing career, when he was still practicing as a vet and would tell reporters who tracked him down, “If a farmer calls me to a sick animal, he couldn’t care less if I were George Bernard Shaw.” Tourists nevertheless found him, and now routinely visit both his real hometown and the TV setting over in the Yorkshire Dales. In the ’70s, at the height of the first wave of Herriot mania, 40,000 fans, the majority American but some from as far afield as Japan and New Zealand, were reputedly coming to Thirsk each summer, as thrilled at finding the real Herriot as they might be by running into Sherlock Holmes outside 221B Baker Street. With books under their arm for signature, they lined up at Wight’s surgery until, after years of book signing, the vet’s hand became almost unusable because of arthritis. “They can’t find my house now because I keep it very quiet where I live,” he says with relief, having moved to a quiet spot outside Thirsk. Paradoxically, Herriot made the sumptous Yorkshire countryside better known in New York City and Yokohama than it was in the south of England, where until All Creatures Great and Small was shown on TV, some Londoners were still convinced that Yorkshire was a collage of dark statanic mills and bleak Bronte moorland. “I’ve been a godsend for little farmers, you know, doing bed-and-breakfasts for visitors,” Wight says, understating as ever. Herriot has brought an entire tourist industry to the Pennine uplands and valleys. Along with the paper, he bought several books of the “Teach Yourself to Write” variety but did not get very far with his early efforts–adventure stories and pieces about soccer, his passion. “I became a connoisseur of that nasty thud a manuscript makes when it comes through the letter box.” Even the first animal book, If Only They Could Talk, which inspired the London publisher Michael Joseph, was limping along in Britain with sales of around 1,500 before a copy made its way to Tom McCormack, then president of St. Martin’s Press in New York City. But whether the James Herriot story will ever be taken beyond this latest installment remains entirely within Wight’s gift. “I will write another book if I feel like it,” he says after some thought. One thing he has to think about is waiting–in the nicest possible way–for people to die. Dead people are notoriously less litigious than the living. There is another proble, however. If the Herriot saga continues to mirror reality, the kindly sage of Darrowby will soon be taking on a literary agent and a phalanx of tough American lawyers, having lunch at the Connaught and tea at the Polo Lounge in Beverly Hills, California, and having more tourists than sick animals lining up outside his vet’s surgery. Wight knows better than anyone that if the Herriot series becomes a literary matrioshka doll, with a wordly success story and global fame nesting inside a simple tale of country people, it will lose the kernel of its charm. And anyway, what would he call a new volume? It Shouldn’t Happen to a Multimillionaire? Thank you for this site! I didn’t know any of this. I turned the 50’s corner some years back and when I recently found myself chair bound with pneumonia I picked up the James Herriot series. I can’t tell you how much I look forward to my daily reading. I get to be outside vicariously but almost palpably, I laugh out loud and and delight in every anecdote. The more I read, the more I am awed by his skill as a writer. Like a painting, a story has to have focus, and everything in the painting, or story, has to lead the viewer, or reader to that focus which i turn highlights the setting sending us back to all the details, which of course lead us again to the focus and around we go, we don’t want to stop, they have succeeded. This man is a Master story teller much like Norman Rockwell whom I consider to be much more than an illustrator, he also is a Master story teller with a paint brush as his medium. The two remind me of each other not just because they both lift our spirits while never sugar coating life, but also because they are both Master story tellers; they are also greatly underestimated, in my opinion. These are not just cute animal stories, they’re beautifully told slices of life, great classics as far as I’m concerned. I am gratified to hear that our author loved his job because nothing else could have imparted such added richness and dimension to his wonderful books. I have re-read this article again after several years of being away. For myself, I have since wrote an ebook, “Only Time Will Tell” that takes place in England and specifically the Yorkshire Dales. In my book, I gave a cameo appearance to young James Herriot during the war. I love James Herriot’s Yorkshire Dales and my wife (Anne an English Professor) and our two children love reading James Herriot’s writings as well. What a treasure for young readers growing up to be able to discover the wonders of life as seen through the eyes of such an insightful gentleman. Previous PostPrevious Welcome to JamesHerriot.org! Next PostNext Is it Normal to Grieve for Months When a Pet Dies?